Pre-season has been in full swing now for several weeks, and Morgan has been putting us through our paces with suicide runs, army crawls, dead ants and more! Although it sounds painful, it’s always great to see the netball girls, and it’s been a great way to keep up with all the netball gossip. From next week we are moving back onto the netball court down at Tiffin Girls school (KT2 5PL) and we are kicking it all off with a guest appearance from an ex-Australian player. 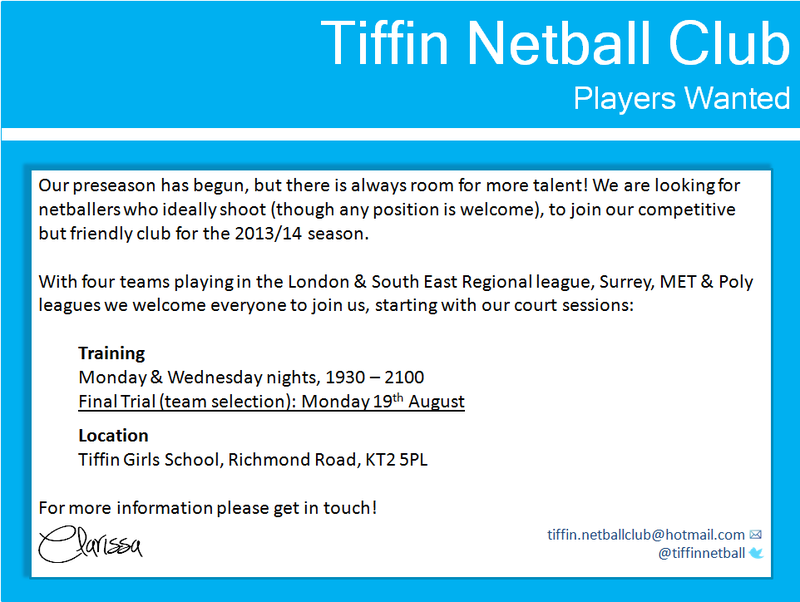 Again, we always welcome new players to come and train with us. Check out our flyer for more details. Club 99 – Preseason training has started with a bang! This week saw Tiffin getting in shape with a spot of pre-season training that involved ‘Club 99’…. think 99 Ab Crunches, 99 Star jumps, 99 Knee Lifts and you’ll get the picture. Despite a few sore muscles the next day, the whole club did a great job – with some people even saying that they had enjoyed it! Preseason training continues with another circuits session this week – the plank and squats are making an appearance. Thankfully the sun is out and the green spaces of South West London are beckoning. A few girls are even doing their exercises on holiday – and of course there will be a fantastic prize for photo evidence of planks in the most exotic destinations! We’ve got Greece and Qatar so far… Keep up the good work Tiffin!